Well hello. I didn’t see you there. I’ve missed you all dearly and wanted to let you know what’s been going on in my life. Also, I always have a lot to say and it all bottles up unless I blog. So sit back and listen to tales of what’s gone down in Piccoland. I’m almost 100% recovered from my wisdom tooth extraction of death. In the recovery process, I found out I had four dry sockets. Have you ever had a dry socket? It’s like a toothache/ear infection/headache all rolled into one fun ball of pain. My oral surgeon only packed the bottom two sockets, and I’m glad because the whole process is horrid. Basically he took gauze coated in clove oil and a sedative and put it on the sockets. Disgusting? Yes. Did everything taste like potpourri until they were taken out? Yes. But I’m much better now and I’m so glad I’ll never have to go through that again. I still have to irrigate the sockets so I’m not eating much stuff that will get stuck in them (sorry to make this post incredibly disgusting). I’ve also only been craving Cream of Wheat and hot chocolate. And by craving I mean CRAVING. I’ve already gone through almost an entire box of Cream of Wheat. That combined with the fact that I wished that I had my glasses this morning to find my glasses because I’m so nearsighted makes me feel like an old woman. So yes, no cooking. But next time my dad goes to the store I’m having him pick up the ingredients for a German chocolate cake, so get excited for that. In the meantime, here’s a picture of the homemade hot chocolate I made. The recipe is on the back of the Hershey’s cocoa box. That’s as homemade as it’s going to get. 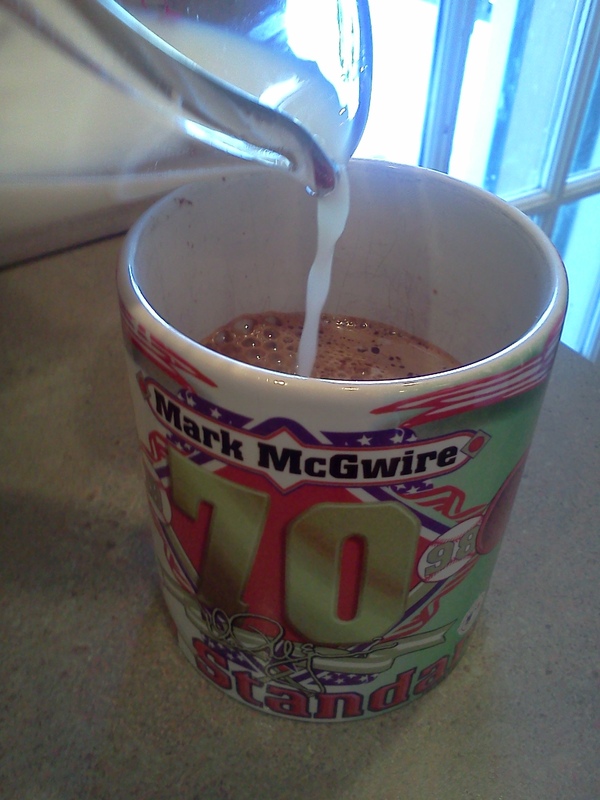 I put it in my Mark McGwire cup because I miss baseball so much. I’m going to ignore the fact that Mark used steroids. I think I’m going to watch the Oscars tomorrow. I’ve never actually watched an awards show. Is that weird? I’m probably just going to watch the first hour because, no offense, I could care less about the acceptance speech from the director of Kon-Tiki. So yes, that’s my life. Any thoughts on Downton? The Oscars? My odd Cream of Wheat addiction? Let it be known that I’m absolutely hilarious after anesthesia. 2/6 1:30am Still awake. I was hoping to have fallen asleep by 11, but I was thinking about the surgery. I had been attempting to do some sudoku on my phone when I realized that I really hate it. So I spent a few hours just staring at the ceiling. 7:00am Wake up after having one of the wost night’s sleep of my entire life. I woke up like every hour because I kept having a dream that my face was being run over by a truck. 7:30am Take an anti-inflammatory medicine. Yummy. 8:30am Take a gigantic 825 mg ibuprofen pill. Chokey. 9:30am Get there and right when my dad and I walked in, the woman at the front desk said, “Ok, we need you to use the restroom!” I felt like I was 5 years old and my mom was telling me to pee before we went to the park because she wasn’t taking me home if I had to go while we were there. I came back from my potty break to hear my dad and the mom of a kid getting his wisdom teeth out too talking about where I was going to college. I felt so popular. 9:45am Go to get a panoramic x-ray so the oral surgeon can see how much my teeth have moved since the last x-ray I got. The x-ray machine wasn’t working so I had to stand there with my head strapped into this contraption to keep my head still and biting on this lever thing for a while. Needless to say, I started drooling a bit. 10:45am Surgery over. I honestly can’t remember much from here until about 1pm. All I remember is that I was convinced that David Beckham took out my wisdom teeth. I looked at the nurse and was like YOU’RE VICTORIA BECKHAM. Remember that I’m saying all of this with lots of bloody gauze in my mouth too. When the surgeon came in he’s like how are you feeling? And I whispered to Victoria “…shhh, it’s David.” Then I remember asking how much chipmunk models made. When the nurse wheeled me out to the car, the nurses were laughing at me and asking who they looked like. I was scared because I saw two Victoria Beckhams and then one who wasn’t even blonde I thought looked like Ellen Degeneres. I don’t remember the elevator ride down, but when I was about to get in the car, I told Victoria #1 that I was going to model so I could save up for an iPhone. The first thing I did when I got in the car was look for my friend Katie in the backseat and freak out when she wasn’t there. I texted her and said that since my dad wouldn’t tell me where she was, I assumed it was top secret. 11:15am Get home and let the hilarity begin. I really don’t remember much of anything that happened then, but luckily my mom filmed me. Thanks, mom. Apparently I was making everyone here laugh so hard they were crying. Also, I was really mean to Sister Celiac. She brought me down a really ugly shirt to change into with a lion on it and I said, “What is this crap?! You are the weakest link. Goodbye.” I do remember alternating between laughing hysterically and crying. 12:00pm Mom decides to feed me ice cream. I hadn’t eaten since 7 the night before and it tasted wonderful. Actually it was so good that I proclaimed it was God flavored. I only remember bits and pieces from here on, but I sort of remember being convinced that the movie Annie was about drugs and that the painkillers made me feel so good, I should be a drug dealer. My mom was talking to my aunt and said I was being hilarious and very surley and I yelled, “Don’t call me surley!“ like “don’t call me Shirley” from Airplane. Hey, I can be witty even when I’m high as a kite. 1:00pm Eat some pudding and take some medicine. I was really feeling fine and was actually excited that getting your wisdom teeth out didn’t hurt as much as people said it did. 2:15pm Pain kicks in. Acutally pain is an understatement. I wasn’t able to take more painkillers just yet, so I was just lying on the couch with an ice pack on my face. 3:00pm PAINKILLER TIME! Started getting texts from my friends asking how I was doing. I really appreicate everyone who talked to me, even those of you who made fun of me. You know who you are. The rest of the day was pretty uneventful because I was falling asleep off and on. 6:00pm Bleeding has slowed down so I’m not having to chomp down on gauze as much. I also attempted to eat some chicken noodle soup broth. You know how hard it is to eat soup when your lower lip feels like playdoh? Very hard, I tell you. 8:15pm I hung out with my best friend. Also known as Oxycodone time again. 10:00pm Time for bed. I started to watch Fringe and realized it’s hard enough to understand the 5th season of Fringe anyway, and it was just impossible while on painkillers. I passed out. 2/7 7:30am Woke up and made the mistake of looking in the mirror. I really should be a chipmunk model. 9:30am Shower and mozy on down to the living room couch. My mom decided to take a picture of me and Spiderbaby together since our cheeks are about the same size. 10:15am Painkillers again. I’m still icing my face on and off for 20 minutes and I think I have frostbite. 1:00pm Oral surgeon calls and tells my mom how funny everyone thought I was. I love making people laugh, even if it requires me being pumped full of anesthesia. 1:30pm Spend the rest of the day sleeping and eating apple sauce and ice cream. 7:30pm Marie brings me a chocolate shake from Steak n Shake. It has definitely been the best thing I’ve eaten for the past 3 days. 9:00pm Marie leaves and I start watching Fringe. I accidentally let it slip that I’ve watched 95 Fringe episodes since August and my mom goes NINEY. FIVE. Are you serious?! Whoops. 12:00am Finally fall asleep. The pain seems worse at night, but that might just be me. today 9:00am Wake up with my right cheek the size of a small dog. My 5th wisdom tooth was on the top right and he had to dig around more up there, which I’m guessing is why it’s so big. 9:30am Take an anti-inflammatory before I ate anything and feel incredibly car sick. Always take the medicine with food, kids. 10:00am Breakfast of apple sauce and pudding. I think this experience is ruining pudding for me. I also got my hair cut. 12:00pm Take some painkillers that I’m officially sick of. They help with the pain but I just feel so sad and foggy when I take them. 1:00pm Say goodbye to my dog, Gemma. Our house just isn’t big enough for a 70 pound labrador plus 7 kids and two parents. Since apparently you can’t kick kids out of the house, we had to get rid of the dog. She’s living with my great-uncle now and I know she’ll love it there, but I’ll really miss her. 2:00pm I’m also officially getting sick of putting ice on my face. It hurts so much but it also hurts if I take it off. Meh. Take a nap and accidentally fall asleep on my side. 4:00pm Wake up from nap in horrible pain. It’s so hard for me to sleep on my back, but if I don’t, hurty things happen. Watch Fringe. I only have 2 episodes left until I’m done with the entire series and this last season has been a major letdown. 5:00pm Painkillers again. The pain has definitely gotten better since the surgery two days ago, but I’m just feeling uncomfortable and on edge. My dad got me vanilla pudding which was a nice change from the chocolate pudding I’ve been eating. 5:30pm Make the mistake of looking at the stitches in my mouth. The incisions are still bleeding off and on, but I’ve only had to use gauze once today. I’m getting better! 6:00pm Friend brings over ice cream bars. She broke into her dad’s stash so I was supposed to keep it on the hush hush. It’s not going to be too hard since I have a hard time opening my mouth anyway. 6:30pm Breakdown crying. I don’t quite know why I lost it so badly. I think it’s a combination of being in pain, the medicine making me feel sick, having my dog leave, not being able to eat (I’m craving biscuits and gravy, pork steak, and waffles), not being able to sleep well since I keep rolling on my side and waking up, and being unhappy with a grade I recently got for school. This whole wisdom tooth surgery stuff really messes with you. 7:15pm Eat copious amounts of ice cream and watch Whose Line is it Anyway. 9:00pm Bedtime on a Friday night? I think yes. I read some stories of people who went back to school/work the day after having their wisdom teeth taken out. You know what I call those people? Coo coo for cocoa puffs. No matter how good you may feel, you seriously need to give yourself a few days to recover. I mean come on, some dude just dug up in your gums to take teeth out and then stitched you up. I know I’m getting better quickly, but I’m just worn out right now. Time for more ice cream.